America’s National Trails System consists of 11 National Scenic Trails, 19 National Historic Trails, and almost 1,300 National Recreation Trails. The Pacific Crest Trail and the Appalachian Trail were our nation’s first National Scenic Trails. Our National Scenic and Historic Trails total more than 55,000 miles and link 70 wildlife refuges, 80 National Parks, 90 Bureau of Land Management areas, 90 National Forests, 123 Wilderness Areas, and 100 major metropolitan areas. More than 230 million people live within 60 miles of a National Trail. The National Trails System Act of 1968, as amended (PDF), calls for establishing trails in both urban and rural settings for people of all ages, interests, skills, and physical abilities. The act promotes the enjoyment and appreciation of trails while encouraging greater public access. President Lyndon Johnson signed the National Trails System Act on Oct. 2, 1968, establishing National Scenic Trails and National Recreation Trails. In 1978, President Carter signed into law a bill that created National Historic Trails. Organizations such as the PCTA work collaboratively through the Partnership for the National Trails System (PNTS) to advocate for trails. Today, the Partnership has 34 member and 8 affiliate nonprofit organizations and works in close collaboration with the five federal agency partners who have jurisdiction over the trails. 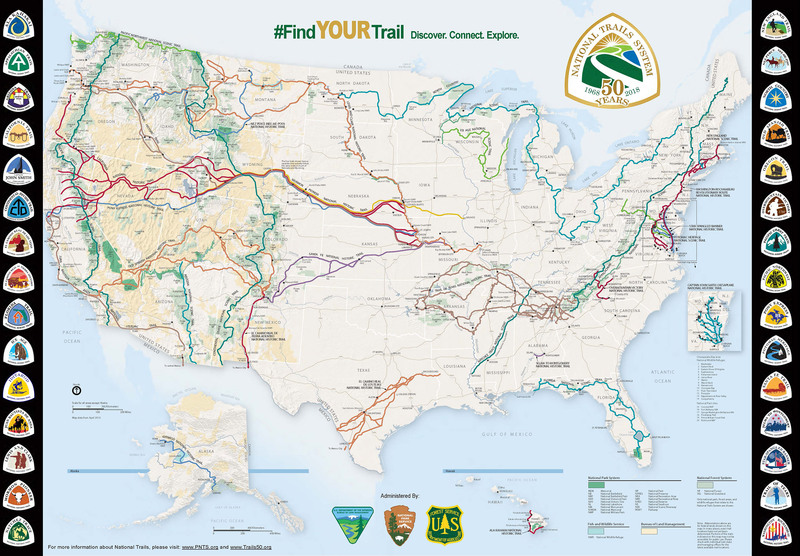 Full-sized PDF of the 50th anniversary National Trails System Map. There are 11 National Scenic Trails within the National Trails System. They are long-distance trails (more than 100 miles long) and are recreational in nature. Just as wonderful for a short day visit as a long-distance backpacking adventure, these trails call to all who want to explore America’s natural landscapes. National Scenic Trails provide for outdoor recreation and “for the conservation and enjoyment of the nationally significant scenic, historic, natural, or cultural qualities of the areas through which such trails may pass.” National Scenic Trails are land-based (not water trails) and their creation requires an Act of Congress. National Historic Trails recognize original trails or routes of travel of national historic significance including past routes of exploration, migration and military action. They follow historic trails or routes of travel as closely as possible. Unlike National Scenic Trails, they may include water-based routes. National Historic Trails can only be designated and authorized by an Act of Congress. National Recreation Trails provide opportunities for outdoor recreation primarily in and around urban areas and have no minimum length requirement. These trails may be designated by either the Secretary of the Interior or the Secretary of Agriculture rather than by an Act of Congress. The National Water Trails System, a subset of the National Recreation Trails system, is a national network of exemplary and protected recreational water trails. A 1983 amendment to the National Trails System Act allowed out-of-service rail corridors to be preserved for future rail use by converting them to trails. There are now 22,000 miles of completed rail-trails and 8,000 miles of projects in progress. Over 2,000 rail-trails exist in 50 states. It’s our great hope that you use, appreciate and support our National Trails.